Clearly the WA, or any other resort, would prefer a full price reservation. But they will surely get more money on a points room than an empty room. The additional costs spent during the stay would of course be a nice bonus to the resort as well. As you said in another post, the resort clearly misjudged how many guests would book using points rather than those paying cash. But anyway, points guests will still spend a tonne of money there ... I expect $20 to be charged for 750ml bottles of water at the restaurants. And then there's that US$912 for a 30 minute boat trip to and from the resort. The resort should have had an opening "special" rate to attract guests but they went the opposite way and started 'high'. I guess when you are asking for $2,000++ per night, you start opening up many other resort options including some with water slides from the upper level of water villas into the Indian Ocean. 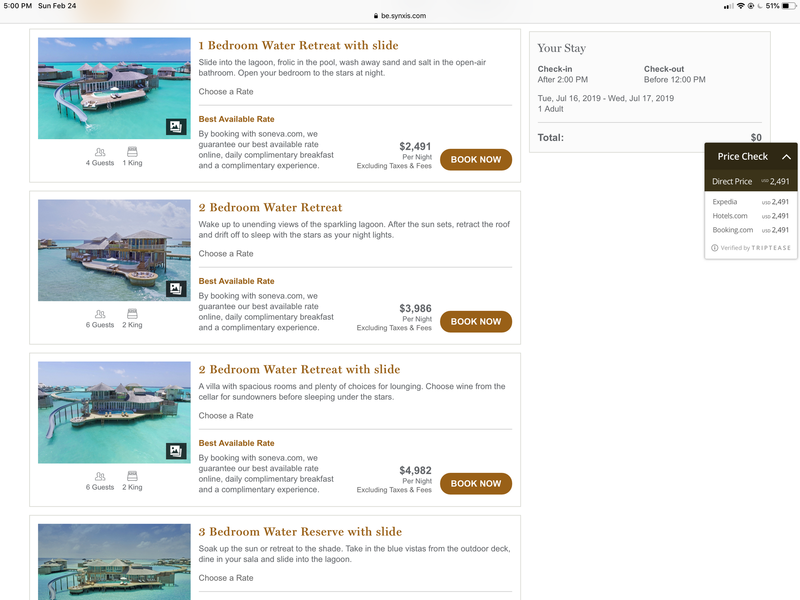 I guess when you are asking for $2,000++ per night, you start opening up many other resort options including some with water slides from the upper level of water villas into the Indian Ocean. Not doubting what you say, but where is it? I am curious to see if WA will be better than those places in other aspects in order to justify the price. Just the dates that I am booked in July, St Regis has rates around the $1200 mark for an over water property, whilst WA has the Asia Pac sale right now asking $1450 for beach villa. Before that, WA was asking for $2100. The Soneva Jani which has the water slide in their overwater villas for $1900, for the same dates. Does the hotel get paid the full price? I thought they only got paid a smaller percentage in which case it would make sense to sell rooms rather then give them through awards. I don't know if this is 100% accurate but I've heard that for redemption bookings a (Hilton) property gets paid closer to the cash rate (BAR, I presume) the higher the occupancy rate is. The info came from a reputable guest who said that's what he was told by senior staff. Makes sense. And to those of you making dummy bookings, presumably you are doing 10 rooms for one night each, correct? Not 10 rooms for multiple nights each. My bad, 9 rooms is the max bookable rooms without making a group booking. And yes, you can do a multiple nights search right away! Just checked my dates (there were 9 available 1 week ago): today only 6! To be fair though, St Regis was almost 3k when it first came out, but I agree that’s a ridiculous price to pay for low season. Considering biting on a 5-night points stay @ WA. Just out of curiosity, is the $740 +taxes +service RT boat transfer the highest in the Maldives? Just a quick perusal of some other properties it seems like it is, even more than seaplane transfers. Amortized over 5 nights we're talking $300+/night for a couple. It's obviously not about the money, per se, as the point redemption is a tremendous value, but it does leave a bit of a bad taste as it seems excessive. I've started looking for private operators to do transfers to Walfdorf. It looks like Waldorf is only 15 Miles from the airport. It looks like speedboats are going for $25 a mile, so that should be about $375 one way for as many people as the boat can hold. Waiting for Atoll Transfers to get back to me though. alanslegal, htran88, MaldivesFreak and 2 others like this. I've scrolled up in this thread for a hundred or so posts: is there any data yet on doing paid upgrades from a beach villa to an OWV? I'm still leaning towards a Conrad booking at 380k for 5 nights, plus probably $100-150 to get a better OWV than the base one. This would be an extra 100,000 HH points, plus a higher upgrade fee (I would assume), but might be tempting to get the newer hotel and the higher W=A service level. BTW, the 120k base beach villa here actually looks more amazing than most of the upgraded types at the Conrad. My wife has the idea of an OWV in her mind though, and I think if we fly all that way we'll want to be overwater. Otherwise we'd just grab some other high-end resort closer to our other planned destinations in Asia. pinniped, alanslegal, Michael19887 and 1 others like this. Poor Man's watervilla haha I will take the poor mans watervilla any day of the week, Especially with $700+ pp round trip boat transfers for a 30 minute ride....for that cost I'd rather take the seaplane and get there in 5 minutes. I was quoted the same prices. I had a similar style room as the reef villa when I stayed at Hilton Moorea, and thought it was a great room. Deck over water, but close enough on land to ice, restaurants, etc. Still looking for more data points before I make a selection. It‘s difficult to compare the boat transfer prices, as WA is or will be the only hotel using a big yacht for a shared transfer. Rethi Rah is charging 300++ for a shared yacht transfer(smaller yacht) or 400++ shared seaplane p.p. one way. Other resorts like Cheval Blanc, Velaa, St.Regis... are offering private transfers with similar yachts, approx. costs 2500-3000 ++ p.hour. I was quoted $7,500 for a private transfer! !